Ok. Let’s face it. When there is a new thing in town we all want try it. Well I do ;-) So when I heard of turntable.fm I was very interested to try it out. Being a DJ and always eager to discover music I thought the idea was quite interesting. At the moment, to sign on, you are required to have a Facebook friend already using it which I did. I loved the concept of having head bopping peeps with DJs playing tunes. Once in, all you have to do is choose your avatar and name and find a room that interests you. And there you go, you are part of the crowd. You can then decide if you like the track or not by clicking on “Lame” or “Awesome”. This will add points to the DJ’s score. You can also become a fan of the DJ which means that next time she/he plays you will be notified. If you want to DJ yourself, you have to click on a free turntable – for busy rooms, you have to be quick on the click and it can take some time. Although the idea of having 5 DJs playing is cool for listeners, it can be time consuming for DJs because each one has their turn to play one song. Having 5 DJs playing and on average 5 minutes per track, that means it takes at least 20 minutes before you can play your track. Of course, if you DJ in rooms that only have 2 DJs, I think it would be more interesting. DJing could be good for testing out some new tracks you or others have produced but you will have to be armed with patience as it is hard to get to a turntable on busy rooms. One thing I really like was the interaction between users. Anyone can chat about what they are listening to. How the track listing you want to play works is that you add them to your DJ queue. And next time it’s your turn to play, the top track on your DJ queue will play. Better have your top track ready! When I played, I found myself wishing that I could create different track lists. I kept changing the tracks queue depending of what the previous DJ was playing, I kind of wanted to keep the same mood or have a musical flow that fitted. Of course, this is my personal opinion. It might be different for other DJs. 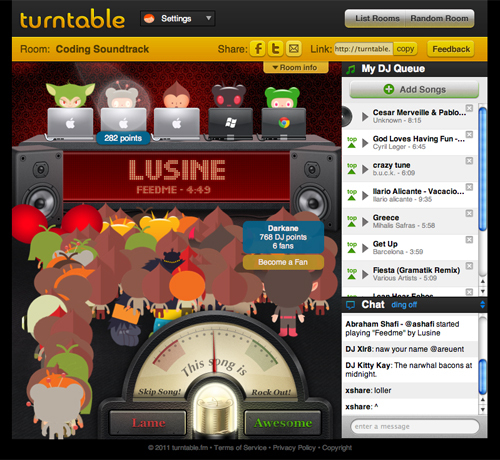 With your points that you accumulate while DJing, you can change your avatar. More points you get, the bigger and different your avatar can become. If you want, you can create your own room. You are then the moderator. You can invite DJs to play. Then, people might show up in your room. It might take time. You need to get DJs that have fans and most likely DJs would prefer to play in rooms that have people in – but you can build it up. The application is simple to use and eye catching. These head bopping characters are really funny. A great app to discover music. It is on a beta phase so only a limited amount of users can be invited. I know a few guys that are disappointed about not being able to try it out. Is it creating a hype? I wonder. Nonetheless, I will follow closely and I’m quite curious to see what they will do next. Has anyone tried it and would like to comment? I want to hear you!